This year, 2011, will go down as the year of unlearned meteorological lessons. The same nightmares keep playing over and over. Remember how ill-prepared Lambert International was on Good Friday when the tornado moved through the north St. Louis area and seriously damaged the airport? Remember how people were trapped on airplanes when the storm struck? Well, that too, has happened again. Tonight, it was Omaha's Eppley Field. The data below are the official weather observations from 7:25 to 7:47pm CDT (the observations are in GMT [Z] on the 19th; for example, 0035Z = 7:35pm CDT). At 7:31 and 7:35 the winds were measured by the airport weather station as gusting to 80 knots which equals 92 mph! The screen capture below is from a video shot inside an airplane (loaded with passengers) waiting to take off as baseball-sized hail is pounding the aircraft. The video can be viewed here. 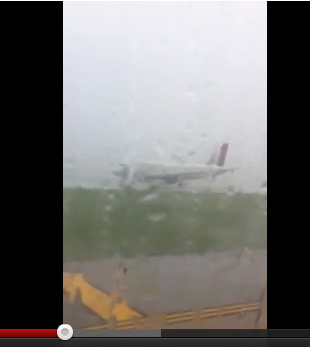 As the hail pelts the airliner, a second plane, taxiing, comes into view as seen below. Screen capture from YouTube video. What in the world were these planes doing with passengers on board during storms with baseball-sized hail and 92 mph winds?! The passengers should have been in a safe area inside the terminal! The area was under both a tornado watch and a severe thunderstorm warning. Eppley had to be closed for three hours due to the damage to the airport! Seven aircraft were damaged. Knowing something about this subject, that damage will, in total, run well into the tens of millions of dollars to repair the aircraft, not to mention the lost revenue and inconvenience of the cancelled flights caused by not having the damaged aircraft in service. And, according to KETV, a Southwest Airlines' pilot was injured during the storm and had to be taken to the hospital. Last week, I had dinner in Jacksonville with a retired airline pilot. We were both in agreement that airline meteorology has not kept up with the rest of the science. As I wrote back in April and May, after the St. Louis fiasco: This will keep happening over and over until someone gets killed. Why? Because the Federal Aviation Administration does not have tornado and severe thunderstorm warnings in the aviation database and the airlines do not seek out that information. So, their crews, airliners, and innocent passengers are left to fend for themselves. This practice is indefensible and it needs to stop. Did the warning actually give winds that high or was it just the usual 60 mph warning? Wow, I guess you can predict what kind of weather is going to hit a particular spot at a specific moment in time? Why the hell aren't you out there saving people? I mean, you obviously knew large hail was coming, so why didn't you do something about it? Get real. Severe Thunderstorms do not always produce hail. And the hail can vary in size. There's no way to know. @10:57am. That is EXACTLY what I do for a living: Save lives and property and have been very successful at it. There is a reason the American Meteorological Society gave me its highest award in applied meteorology for my work in the field of storm warnings. @10:57 AM - This storm had obvious significant hail signatures. GR2Analyst software had a maximum hail size indicator of 5 inches just east of the airport. The storm, well north of the airport, had a history of baseball sized hail. As a community, we DID know that the airport was facing significant danger. I know it takes time to load a plane, but you can unload a plane safely and securely in a few minutes. That should have happened with the plane photographed. Mike, I agree with your post's first line - it feels like people have gotten hurt and killed all year (in terrible numbers), and nothing changes, that people don't care. I agree that there are upgrades to the Aviation community that need to happen, but how do we get people to just plain care? @7:14pm. Three people died in flash flooding in Pittsburgh this evening. They were in their cars. Remember, "Turn Around, Don't Drown."? I don't know what it is lately...it seems we are losing far too many people in ways that just should not happen. Aviation limits takeoffs and landings - you can't do that if there is lightning within 5 miles of the airport. Lambert field routinely did that when I was flying there almost weekly two years ago. Air Traffic Controllers/ Tower Controllers need to take heed and follow their own rules. Pilots need to push back and not put their passengers in danger. The rules are in place - no one is paying attention. Do we need to have an FAA auditor of such things? Folks, we have to remember - the PILOT is in charge of the aircraft, not the FAA or a controller somewhere. Working with the dispatcher, the PILOT makes the decision to push back, to request clearance for take off, to request clearance to land. Unless my memory is faulty, or rules have changed, the air traffic system will always give clearance when a PILOT requests unless the facility is shut down or the runway is blocked. And, the FAA does not have authority to close an airport, that rests with the airport manager.